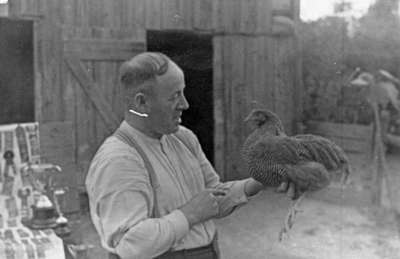 A black and white portrait photograph of John Thomas (1885-1950) holding a Barred Rock Hen. John Thomas was born at Carmarthan, Wales on November 14, 1885. He came to Canada in his teenage years and worked at the R.J. Fleming farm at Pickering Township and King Brothers' Tannery, Whitby before being appointed as Whitby's night watchman in April 1921. As well, he was a breeder of chickens and won many prizes at the Canadian National Exhibition and local fairs. He died at Oshawa General Hospital on January 28, 1950 and is buried at Groveside Cemetery, Brooklin. John Thomas with hen, c.1940, Marjorie Ruddy. Whitby Archives 31-009-435.